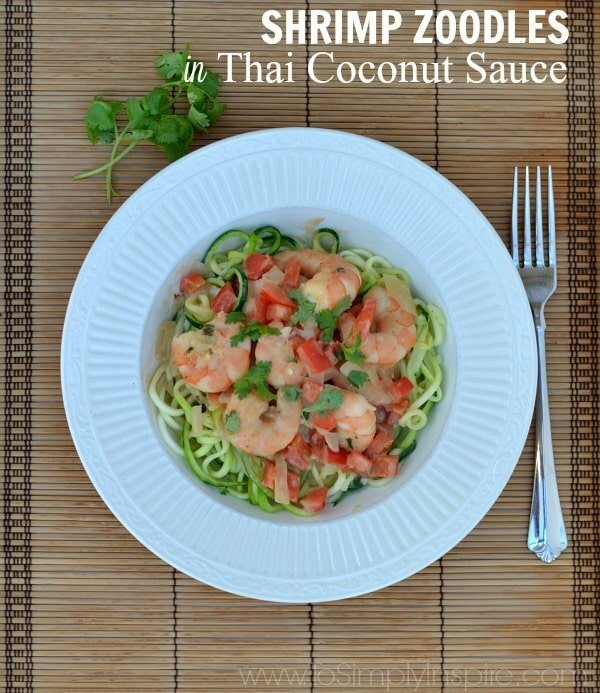 Shrimp Zoodles in Thai Coconut Sauce is a simple, deliciously creamy meal bursting with fresh flavors. Another healthy option that is ready in less than 30 minutes. After the making super simple Cod with Tomato Basil Sauce earlier this week, my mind has been focused on bringing more easy seafood dishes into our lives. I have said it many times before, it’s all about the sauce. You can prepare the same basic foods and just change the flavors for so many new meal ideas. With my main protein sources being chicken, turkey and seafood, I have to get creative to keep things interesting. For some reason when I think shrimp, I think Thai food and the amazing sauces. 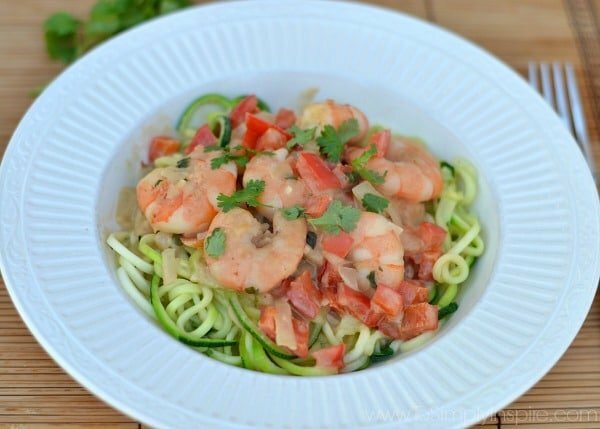 This Shrimp Zoodles In Thai Coconut Sauce was a great dish to prepare using my Ninja® Intelli-Sense™ Kitchen System with Auto-Spiralizer™ I received to try out. 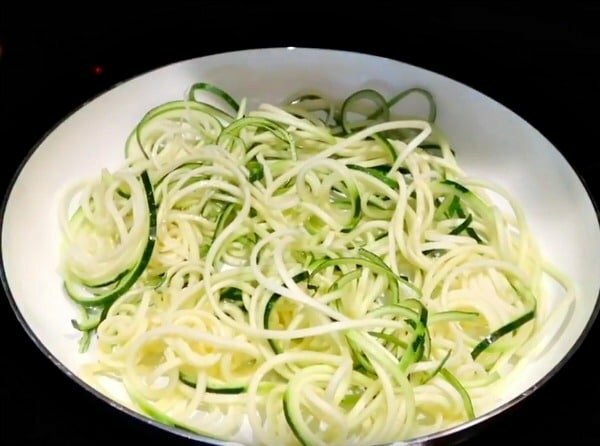 Let me just tell ya, making the zoodles and the sauce using one blender appliance was fabulous. Watch the video below of me showing you all the fun stuff that comes with this system as well as the recipe! 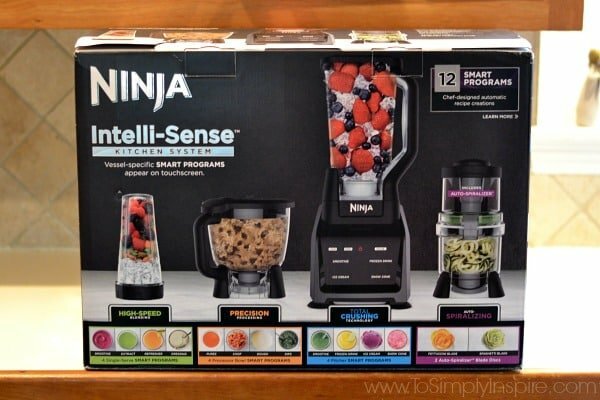 The Ninja Intelli-Sense Kitchen System with Auto-Spiralizer features one smart base that transforms into four high-performance appliances: 72 oz. Total Crushing® Blender, 64 oz. Precision Processor™, 24 oz. Single-Serve Cup, and Auto-Spiralizer. I used the Auto-Sprializer for the zoodles and the Single-Serve Cup to mix up the Thai Coconut Sauce. I have big plans to make so many of my dips and sauces with the food processor attachment as well!! 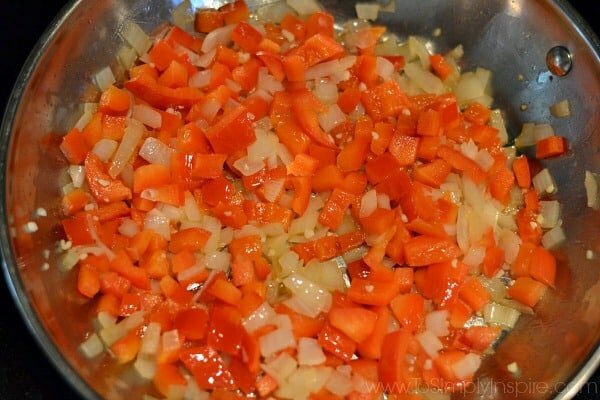 Add the onion, garlic, peppers and cook until softened, about 5 minutes. Transfer the peppers and onion to a bowl. 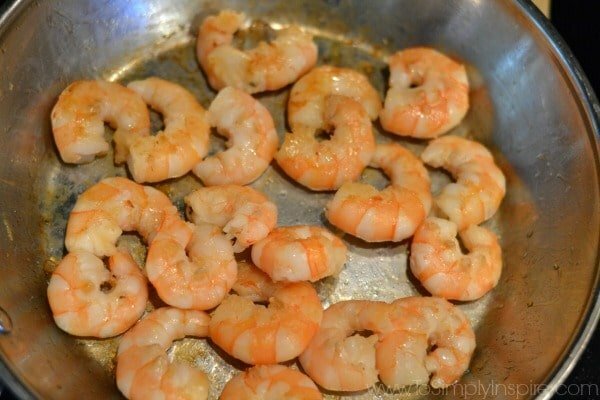 Add 1 tablespoon of oil and cook the shrimp for 2 minutes, then flip and cook for another 2 minutes or until opaque. In another food processor (like the Ninja) add the coconut milk, peanut butter, lime juice, brown sugar and ground ginger and pulse until blended thoroughly. 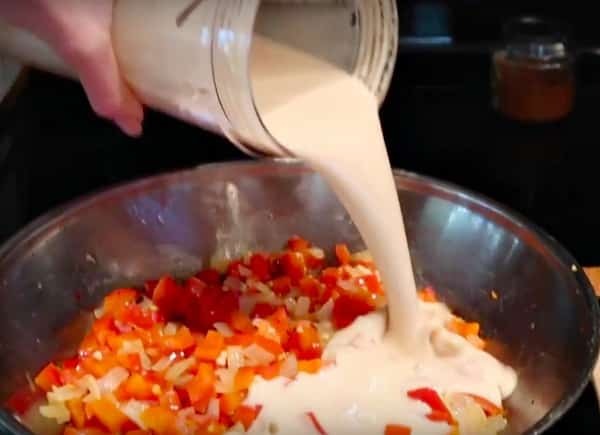 Transfer the cooked onion and peppers to the skillet and pour the coconut milk mixture of the peppers. Bring to a boil then reduce to simmer and cook until reduced by half, about 5 minutes. 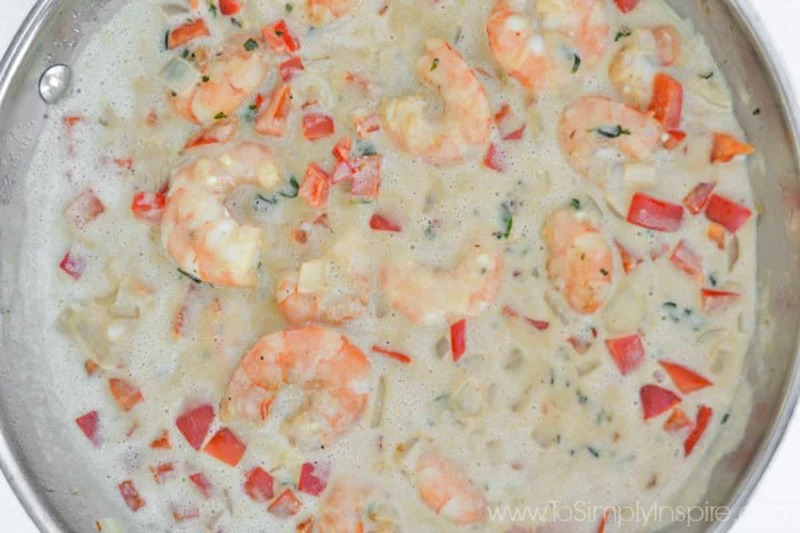 Add the shrimp to the sauce in the skillet and add the basil and cilantro and toss to coat. Craving more shrimp and seafood recipes? Try these favorites too! Orange Garlic Shrimp with AsparagusThis post was created in partnership with Ninja® Intelli-Sense™ Kitchen System with Auto-Spiralizer™. I received complimentary products and compensation to facilitate my review, but all opinions within are my own. 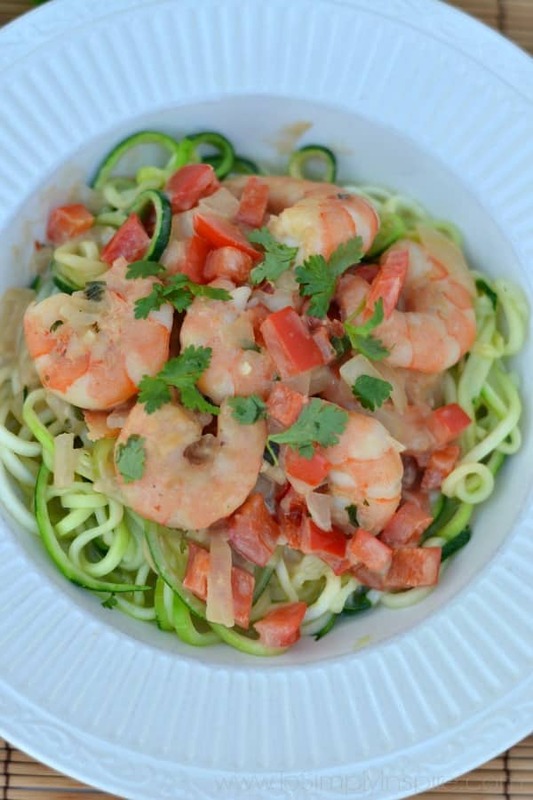 Your Shrimp Zoodles In Thai Coconut Sauce will be amazing! Hope you have a fantastic week and thanks so much for sharing with us at Full Plate Thursday!